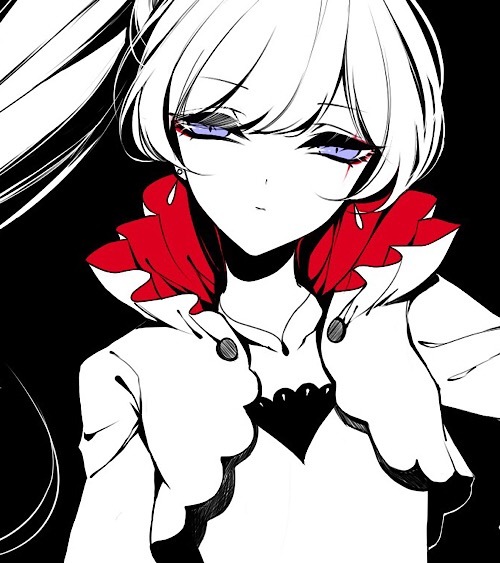 Overall: Elise is a teenager of average height with a slender build, she usually does her long white hair up in a ponytail, usually facing the left side. She has blue eyes and a heart-shaped face. She tends to wear outfits that suit the high class such as dresses with the addition of sorcerer's robes. Her most used outfit is a white bolero jacket with a skirt, white dress shirt, and a necklace. The bolero jacket has a red trim inside and the tattoo of her guild is on her right hand. On formal occasions, she tends to wear blue gowns with a white sash along with all the jewelry that she was given by her own mother. Personality: As a lady of wealth and taste, Elise is expected to be a woman of high class and grace, hence why she tends to prefer manners over being casual with people. Despite her upbringing, she has a kind and caring personality and will go out of her way to help out people if they needed it. Her helpful demeanor has earned her the trust of many associates, it was why she was raised to be such a perfect daughter after all. With the death of her mother at a young age however, she started to grow distant and withdrawn. Despite the silver spoon that she was given, she wishes to live a day where she won't have to follow the rules of the rich and wealthy which made her lonely inside. It is for that reason that she tends to be sheltered and unaware of the lives of the commoners which some may envy her position. Being told to make acquaintances with only the nobility and the wealthy people only made that loneliness grow more inside her heart. She has some trouble with trying to understand how they feel and look through the eyes of the commoners, but she hopes to learn it one day. Despite her loneliness not being able to have her interact in a normal way, she feels proud of the lineage that she was born into and it shows. Family honor is a common practice in her family and she wants to live up to that honor as much as she can, thus it would allow her to familiarize herself with other nobles. At the same time, she does not hesitate to be generous with the poor and even gives them money to go out and buy themselves food from the market. Overall, she does not like her pride in her family's lineage insulted, but would never participate in dealing out insults either. Tea: As a lady of wealthy taste, she likes to drink tea and she would take any kind of tea, even the bitter kind. Friends: She wishes to have more friends, but due to her upbringing, it may be hard for her to understand how the commoners feel. Bullying: She may not be a bully hunter, but she dislikes people making fun of others and goes out of her way to stop it before it gets worse. Spicy Foods: She hates spicy foods as it does not sit well with her tongue. Now if it had mild spices, she might eat it. Helping out the poor: She resolves to help out her father by helping out the people, so she aspires to be the best person she could be for them. Losing her father: With her mother's death at a young age, she fears for the loss of her father someday, so she tries to make him happy whenever possible. It was for that reason that she doesn't wish to lose the only family she has now, barring cousins and other members. Not being able to help someone: She fears that the person she was helping currently would take drastic measures to their health, but she would probably accept that they wouldn't need further help. Magic Description: The magic that her ancestors learned throughout the ages. It takes the general appearance of a white snowflake sigil when spells are cast. When offensive spells are cast, the sigil turns blue and when defensive spells are cast, the sigil turns light blue. Suppplementary spells being cast turn the color of the sigil into a indigo color and self-buff strength spells have the sigil turn into a cyan color. Due to the many methods that ice can be used, it is essential for offensive, defensive, self-buffing strength and supplementary spells. History: Elise is born to a wealthy family situated in the holy city of Crocus. Her father served the military of the kingdom of Fiore as a knight while her mother was content as a stay at home mother for her daughter. Of course, Elise was raised as her family's heiress, she would have a lot more responsibility with keeping up her family's name. She was happy being with her mother as her own mother was a kind and caring soul to her. However, tragedy would strike the happy family as when Elise was just nine years of age, her mother was stricken with an unknown illness. Her father had done everything he could to help his beloved wife get better again, but she soon passed away. As a result, the young girl became withdrawn and distant, refusing to interact with others for a while, only she interacted with her father if he asked her for help. She had never lost the will to help others and it was her mother's dying wish that she would remain the ever so diligent and kind young lady that she wished to be. As she grew into a beautiful and elegant young lady, she saw a different world with the low class and how they went about with their lives. Her father of course, did not remarry after his wife's death, but he remained a good parent to his daughter. As a result of seeing her father's sadness, Elise wished to help him out of his depressive stupor. Thus at the age of her adolescence, she had set out to learn the magic of her ancestors which allowed her to help make people happy and keep the people of Fiore safe. As long as her mother's dying wish would be fulfilled the more she helps others, Elise would be content knowing that her late mother would be proud of her too. Aristocracy/royalty is currently restricted given the site's lore. Since that facet is so entwined with your character, it'd be great if you could rework and amend it. You may be from a wealthy family, just not as nobility. You can perform Self-Buff Strength spells as a Sorcerer, please add that in your list. Bump when edited, looking forward to having you here! - Made edits to amend the history to just being an heiress of a wealthy family. - Also changed the description to just the appearance of the magic. - Added Self-Buff Strength Spells to the list. Thank you for your time! I hope I did it appropriately as possible. Thank you for all your edits. Your application is almost ready for approval. Just a quick note, you are requesting to join the Phantom Lord guild, please know that this is a dark/bad guild and it will restrict you to bad quests etc. Given your character's personality, are you sure of this choice? Made her personality and history a bit longer to hit the 300 word count. And yeah, I'm pretty sure it's my choice. I'd like to have my characters go through a moral crisis if they're in a bad/evil group. She could be the token good teammate of that guild. Either way, I don't really mind if I'm restricted to bad quests.